Monmouthshire is steeped in history and heritage; ancient castles, stunning rivers and gardens, bustling market towns and captivating visitor attractions are all on offer. However, there are hidden gems across the county which remain locked behind doors or closed to the public. How many times have you wandered past an ancient building and wondered what it is like on the inside? The Civic Trust for Wales, on behalf of CADW, will be holding its Open Doors Weekend on Saturday 10th and Sunday 11th September. During this weekend, and indeed during the month of September, historic properties, many of them usually closed to the public, will be open for visits free of charge. Wales enjoys a rich heritage and Open Doors is a fantastic opportunity for people to explore it. The Welsh Government is committed to making the country’s history as accessible as possible and I urge everyone to see what properties are open in their area. There is a significant variety of sites and events this year spread across all local authority areas of Wales during the Open Doors weekends…Open Doors Days take place throughout September and offer the public free access to places and buildings of historic and architectural interest. As usual, the Tithe Barn and St Mary’s Priory Church in Abergavenny will be open to the public and we look forward to welcoming visitors from all over the world. Volunteers will be on hand to talk about the Abergavenny Tapestry and conduct guided tours around the historic Priory Church. Gifts, including Holy Socks, Sugar Loaf Soaps, Caldey Island chocolate, Wentworth jigsaws and souvenir cards will be on sale in the Tithe Barn gift shop. Visitors will also be able to sample local food in the Tithe Barn Foodhall. Beautifully restored, grade I medieval church set in lovely countryside. The church contains a 15c wall-painting of St George, discovered during the recent Restoration, which the Royal Commission on Ancient Monuments described as the find of the decade. Talks on the Church’s history will be available between 2pm and 5pm. St Mary’s was rebuilt in 1875-6 by the architect John Dando Sedding who carefully reused some of the original fabric and introduced a rich decorative scraffito scheme. This has recently been conserved by the Friends, with grants from Cadw and The Pilgrim Trust, in memory of Lord Jenkins (Roy Jenkins). The chancel roof and much of the window tracery are medieval, whilst the 15th century chancel screen and Norman font are survivors from the earlier building. The north chancel window contains fragments of medieval glass whilst some monuments and floor slabs of the seventeenth and eighteenth centuries were also incorporated into the rebuilding. In the churchyard is a late medieval cross to which Sedding added a new top. Heywood Sumner introduced sgraffito panels to enhance the interior, taking The Benedicite as his theme. This technique, which uses thin layers of different coloured plaster which are cut back to reveal the required colour underneath, was Roman in origin, but had been reintroduced into Britain by Henry Cole at the Victoria and Albert Museum. True to medieval tradition, Sumner included local features in his designs – for example in ‘O Ye Mountains and Hills’ on the north wall of the nave the nearby River Usk, the Sugar Loaf and Llanvihangel Gobion church tower are all included. The sixteen sgraffito panels present a remarkably complete example of this style of work, and under the window which depicts “All Ye Beasts’ you will find his initials HS and the date 1888. The Tithe Barn, Abergavenny, endeavours to support and promote local businesses and entrepreneurship. The recent chef demonstrations hosted by the Abergavenny Food Festival certainly helped to raise the profile of many small producers in Monmouthshire as well as celebrating the wonderful selection of fine restaurants on our doorstep. Mike Morgan, owner of the Llansantffraed Court Hotel explained that it is “critical that we all buy our food locally” to ensure that business in Monmouthshire have a bright and prosperous future – the underlying theme of the Back 2 Business week hosted by Monmouthshire County Council earlier this summer. But it’s not just local food suppliers that we try promote at the Tithe Barn. The gift shop stocks a number of locally sourced items including hand made soaps by the Sugar Loaf Soap Company, cards produced by local artist Elizabeth Brown and hand crafted bread / cheese boards by Naturally Created. It also stocks a number of books about the local area and books written by local authors. Local historian and team rector for the Benefice of Magor, Mark Lawson Jones, has recently published a book which explores the history of Christmas Carols. 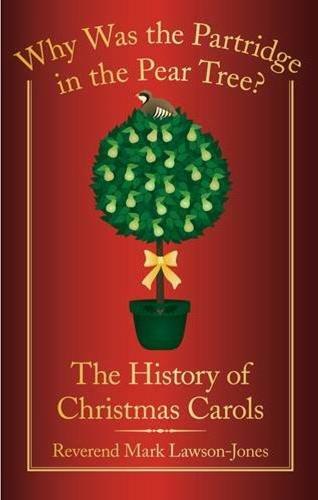 The book, Why was the Partridge in the Pear Tree, examines Christmas Carols from their earliest incarnations in the Middle Ages and their banning under the Puritans to the wassailing traditions of the nineteenth century and the carols that united the soldiers on the Western Front during the First World War. The book will be available to purchase from the Tithe Barn from the start of September and signed copies will be available for the first few customers! Come and explore the wonderful selection of gifts and books available in the Tithe Barn, including the ever popular Holy Socks. We look forward to welcoming you! The Magnificent Abergavenny Tapestry in the Tithe Barn was created by the Abergavenny Tapestry Group to celebrate the new millennium in 2000. In the tradition of the great Bayeux Tapestry, it tells the story of Abergaevenny on a grand scale. At 24 feet (8 metres) wide and six years in the making, the tapestry was a mammoth undertaking, but which became a labour of love for the team of over 60 ladies who worked on it, many of whom made new friends and learned new skills in the process. The stitching was carried out in one of the chapels in St Mary’s Priory Church, with each section of the tapestry created on a separate frame, and more than 400 shades of wool were used to create the intricate designs. Visitors to the church were fascinated by the work, and the stitchers often found themselves explaining the proceedings to interested tourists! The masterpiece was kept in storage for a time after its completion and was briefly unveiled most notably during a three-day flower festival, the ‘Floral Tapestry of Saints, Splendour and Sanctuary’, which was held at the Priory Church in July, 2006. The tapestry was then put back on display at the Lewis Chapel in May 2007 – due to public demand. Stitchers viewed their work on the tapestry as “painting with wool”. All the volunteers’ names have been preserved for posterity, embroidered on a separate piece of material which has been sewn into the backing so that the names will never be separated from the tapestry. Four hundred shades of wool and only three types of stitches were used in the work of art. Random straight stitch uses seven different coloured strands of wool to give soft shaded effects. 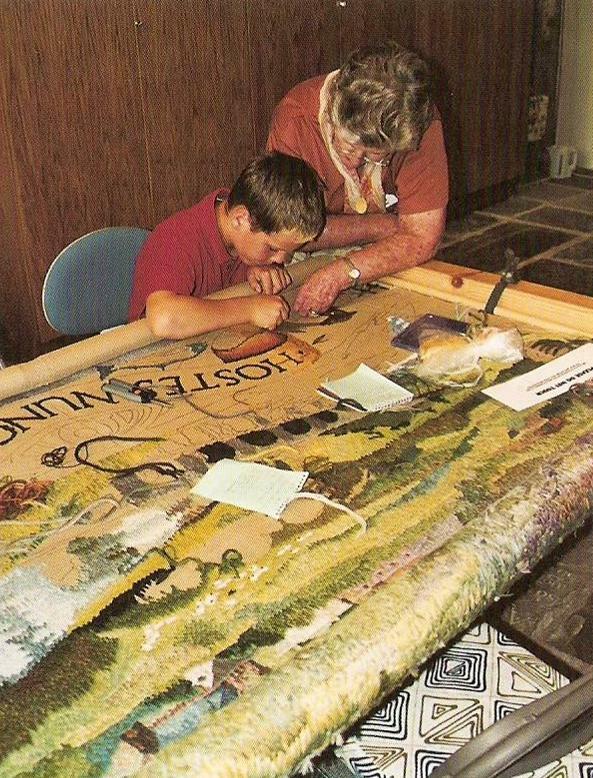 It was used to create the landscape section of the tapestry. Tent stitch uses five strands of wool worked in diagonal rows to give a basket-weave effect on the back. Used to create the outer border of the tapestry, tent stitch has a tighter look to give more detail. Petit-point is a scaled-down version of tent stitch using only two strands of wool for very fine detail and an even smoother texture. It was used to create the church windows in the border. The Abergavenny Tapestry is on permanent display in the Tithe Barn exhibition. Some of the original stitchers volunteer as guides to explain the tapestry and give their own personal account of the stitching process. Why not pay them a visit and admire their work. Entrance to the exhibition is free although there is a charge for large groups. Souvenirs of the tapestry, including post cards, Wentworth jigsaws and a beautifully illustrated book are available to purchase from the Tithe Barn Gift Shop. Many years has passed since the Tithe Barn had been properly looked after, and certainly the Trustees of St Mary’s Priory Development Trust had quite a lot to consider when they purchased the building in 1999 in order to bring it back into Church ownership with the view to restoring it to a usable state. 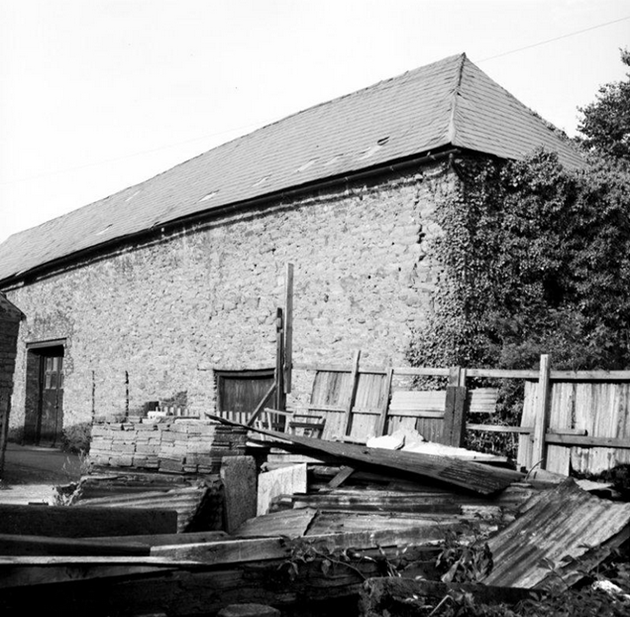 With the help of local architects Morgan & Horowskjy, a Conservation Plan was drawn up in 2000 entitled “Conservation and Restoration of the Tithe Barn.” Following an archaeological survey by a team led by Dr George Nash and agreement from CADW to fund them, emergency repairs were carried out in 2001 to stabilise the building as it was feared it would become dangerous and require demolition. Stabilisation work commenced in 2002 by the appointed contractor Davlan Construction Ltd. of Newport, with the outcome that the St Mary’s Priory Deevelopment Trust now owned a building of great historic note which was worthy of further development to turn it into a Heritage Centre for the entire side and the wider community. Considerable administrative work was then started which included an Access Plan, an Audience Development Plan and landscaping to the Tithe Barn Courtyard – all items which would be requiring in order for the Trustees to make their successful claims for funding from major funding bodies. In 2003 Morgan & Horowskjy were again called in to design a building which would include a Heritage Centre, an exhibition space, a restaurant and a Learning Area available to all. Before major structural work could be started, a newly identified crack in one of the walls of the building required remedial action and extensive steelwork was designed, commissioned and installed in the building. This innovative piece of engineering was described and installed by the architect as being a suspension bridge on its side, and although the tension cable is visible running around the upper level, the large steel girders necessary to achieve the future stability of the building are hidden within its massive structure. Specialist Heritage consultants were interviewed by the Trustees resulting in the appointment of the Continuum Group from York, who were to design the best experience possible for visitors of all ages to the Tithe Barn. The Exhibition Space features the Abergavenny Tapestry, an amazing creation celebrating the Millennium, taking 5 years of work by the local Tapestry Group, and which was always destined for display on the first floor of the Tithe Barn. A Learning Development Consultant was appointed to liaise with educational bodies in Monmouthshire and further afield in order to create learning packages for various ages and abilities, both academic and practical. The first floor Learning Space is also available for hire to small groups, ideal for talks and audio-visual presentations. The Welsh Assembly Government sponsored the Tithe Barn Food Hall, supplying Cardiff-based Howel Food Consultancy to advise on menus, layouts, kitchen requirements and franchisees. The Tithe Barn Food Hall promotes True Taste products and producers, and will be the venue for many prestigious food-based events throughout the year, notably the Abergavenny Food Festival. The colour schemes throughout the building have followed the colours used in the Abergavenny Tapestry and eco-friendly products have been used throughout, where possible, in the building materials. 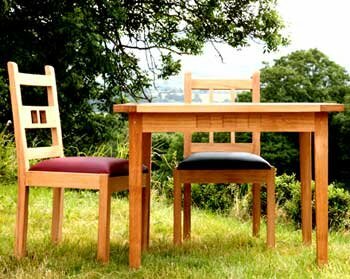 Even the hand-made oak dining furniture echoes the design of the pigeon-holes on the Tithe Barn’s exterior. To make St Mary’s Tithe Barn a remarkable place to visit to learn about local history including the heritage of St Mary’s Priory. Looking at the refurbished Tithe Barn, the visitor is assured that the St Mary’s Priory Development Trust has been successful in its aim, and that the Tithe Barn will continue to be a building of great historical note for many years to come. A copy of this booklet, exploring the complete history of St Mary’s Tithe Barn, is available from the Tithe Barn Gift Shop. Holy Socks, a company which makes socks adorned with the Christian message, will be visiting Monmouthshire during the Abergavenny Food Festival weekend and will be selling their socks and other biblical items in the Tithe Barn. The socks, made in Scotland, have been very popular in the Tithe Barn Gift Shop and frequently provide a smile and laughter. They are a perfect gift for both committed Christian or someone of no faith at all – in fact, I know that Bishop Dominic has a pair of Holy Socks (seriously, have a look at his feet next time) and many clergy in the Diocese of Monmouth have been given them as a presents over the last few years. The company is managed by Margaret Wyllie who has developed Holy Socks from an idea which she had while attending a course with the Scottish Churches Open College several years ago. The idea that life is a journey is widely understood now. What Holy Socks seek to do is take that idea one step further to pilgrimage. The company, which is located in Newton Stewart, was set up in 2000 and since then have gone on to design a wide range of socks, featuring Biblical characters, stories and verse. The Holy Socks have been worn all over the world with visitors taking them back home as gifts for family and friends. Tithe Barn manager, Richard Morgan, even wore a pair of Holy Socks on his trek in the Himalayas! The socks have been a huge success in the Tithe Barn and we have recently placed another order in time for the Abergavenny Food Festival. For food-lovers there will be some food-related designs, including ‘Loaves and Fishes’, ‘The Vine’ and ‘The Fish’ and for Welsh speakers we even have ‘Sanau Sanctaidd’ with biblical stories in Welsh! Over the next few months we will be working closely with Monmouthshire web designer, David Siddall, to completely redesign the St Mary’s Priory website. We have already seen examples of David’s work, including the Abergavenny Food Festival website, and are delighted to be able to work with David and his wife, Angela. 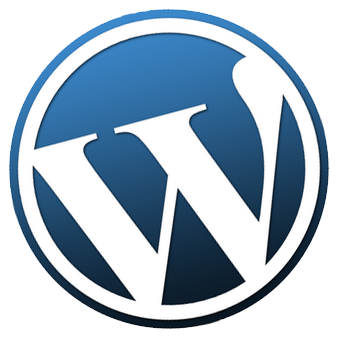 The new website will be much easier to navigate; it will be a dynamic site with live twitter feeds, links to Flickr and YouTube and will also incorporate three separate blogs which members of the Church community will be able to make regular contributions. The historical market town of Abergavenny, on the edge of the Brecon Beacons, hopes to have a visit from Piers during the month of September. Piers Bramhall has it all. Nice shirts. A winning smile. Great taste in cheese. There’s just one thing. His girlfriend, Emma, says he’s in a holiday rut. So Visit Wales has invited him to Wales to keep him off the sun-lounger. Tourist attractions across Wales have been encouraged to explain to Piers and Emma why they should come and visit. The couple from London, who have accepted the invitation to spend their holiday in Wales, will use the advice given to make a truly memorable holiday in Wales. Yesterday a film crew arrived in Abergavenny to record a short film about the Tithe Barn and St Mary’s Priory Church in Abergavenny. The two films, which will be uploaded onto the Visit Wales Facebook page, will be watched by Piers and Emma and will hopefully influence their decision on where to visit next month. The history, heritage and hospitality which the St Mary’s site has to offer will, I am sure, be a very important deciding factor. Piers and Emma will be able to explore the interactive exhibition in the Tithe Barn, talk to the stitchers who worked on the famous Abergavenny Tapestry, see the 15th Century carving of the Jesse (described by Tate Britain as one of the finest medieval sculptures in the world) in the Priory Church and relax with a coffee in the beautiful Tithe Barn courtyard. Piers certainly won’t go home hungry – Monmouthshire is well known for it’s food tourism! 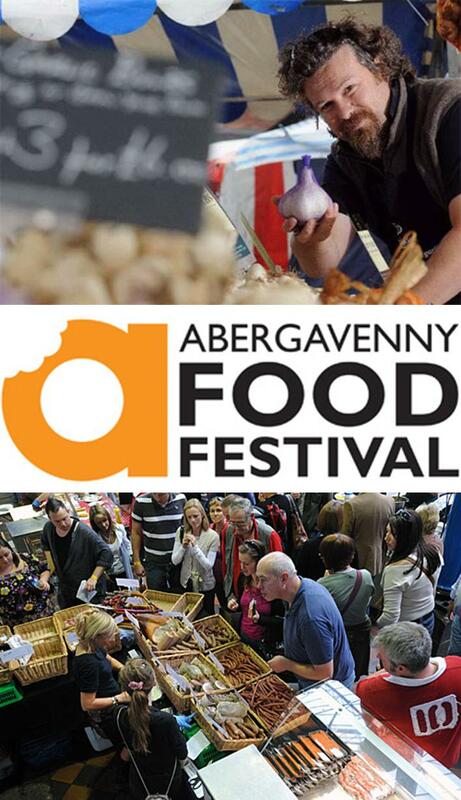 The annual Food Festival in Abergavenny, which takes place this year on 17th / 18th September, is something which Piers and Emma should highlight in their diary. Mountains of cheese, chocolate and charcuterie, an explosion of chilli, a long cool beer – it’s all about sensory extremes and subtle contrasts. The Food Festival, which started in 1999, now attracts around 40,000 people a year and offers visitors the chance to purchase great products, speak with the producers and experience top-end masterclasses. If Piers and Emma are looking for a romantic dinner, sampling the very finest of local cuisine and fine wines, then there are a number of fantastic , award-winning restaurants in the area. Or if they are looking for a delicious afternoon tea with a glass of Champagne, then the Angel Hotel in Abergavenny, which has recently won the Tea Guild’s Top City and Country Hotel Tea Award and is only a short walk from St Mary’s Priory, is the place to visit. I hope that the beautiful scenery, fascinating history, outdoor activities, some of the finest golf courses in the country, superior accommodation and gourmet dining will entice Piers and Emma to Monmouthshire and look forward to welcoming them to Abergavenny and St Mary’s Priory. Please follow Piers and Emma on Facebook and Twitter and explain to them why they should visit!